Democratic Michigan Rep. Brenda Lawrence apparently hasn’t been paying the rent on her Washington, D.C., apartment, and has been hit with an eviction lawsuit. D.C.’s online court records confirm the summons, stating an initial complaint for non-payment of rent was first filed July 13. The suit is being brought by 909 Jersey Ave. Acquisition, LLC, which operates a high-rise apartment complex just a few blocks south of the U.S. Capitol. It’s not the first time Lawrence has failed to pay rent. In 2010, when Lawrence was running for lieutenant governor of Michigan, a condo co-owned by Lawrence and her daughter was hit with a foreclosure notice after falling over $75,000 behind in mortgage payments. Lawrence brought the account up to date shortly after the foreclosure notice came to light. In 2008, while serving as mayor of Southfield, Mich., Lawrence complained that foreclosed homes were a “cancer” for the community. On the other hand, in 2010, Lawrence bashed the banking industry for allegedly “redlining” certain communities by refusing to give them mortgage loans. 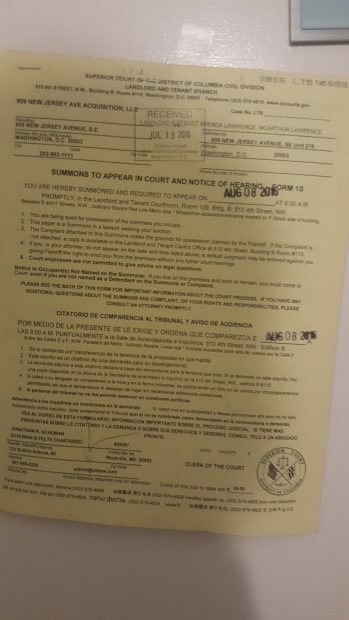 TheDCNF contacted both Lawrence’s congressional office and Jersey Ave. Acquisition’s attorney regarding the eviction suit, but did not receive a reply from either. If Lawrence has fallen behind in her rent payments, it wouldn’t be exceptional. Lawrence is a retired postal employee, while her husband is a retired autoworker. Congressmen and women are paid $174,000 per year, and several members have complained about the expense of maintaining a household both in D.C. and in their home state.